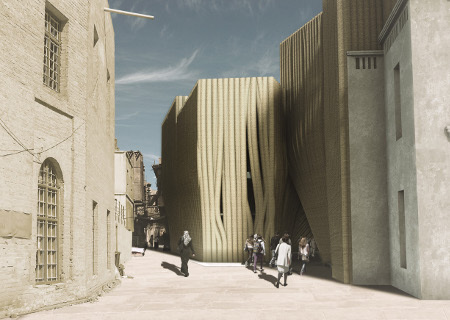 The project is a proposal for a Design Center in the site of the old Baghdad Governorate Building. 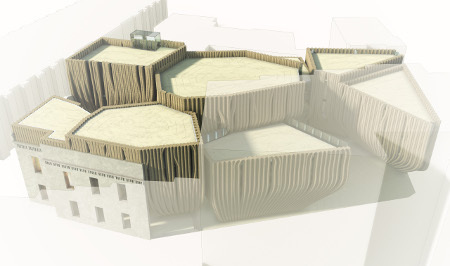 The design for the new Design Center is directly inspired by the cultural and geographical context. Traditional Iraqi architecture and the special climate condition are the driver factors of the project. The climate of the place of destination has mostly influenced the design of the citadel, which took into account the need to mitigate the effect of high temperature on access and the usability of the site throughout the day, in the various seasons. The site has been subdivided in different units, representing the many faces of design. The volumes coming from this subdivision are then contracting at the bottom to define funnel like shapes. 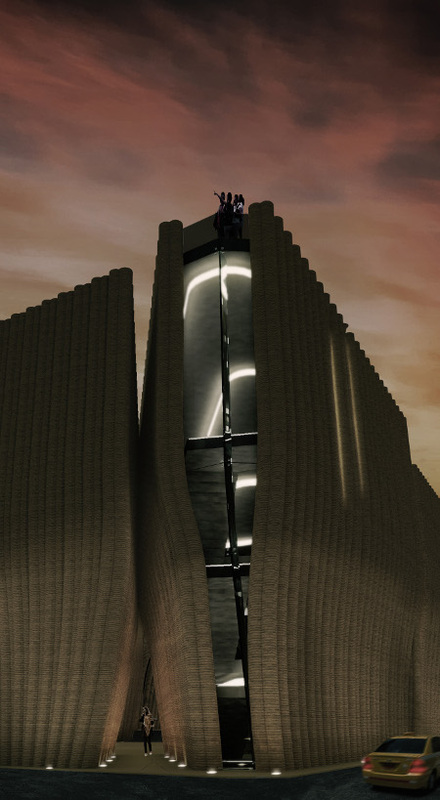 The buildings are touching each other on top, creating connections through them and detaching at the ground level so to generate gateways to the two main plazas. 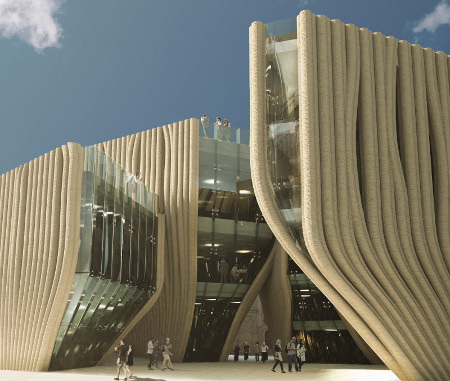 This guarantees a continuous connection between the surroundings and the public space at the core of the Design Center, but the buildings act also as a filter, generating at the end, a porous boundary. This contraposition between mass and void, public and private spaces, gives birth to a small citadel, The Design Citadel, with all its diversity. The spatial configuration has advantages not only in terms of cultural contamination, but also for physical reasons: the buildings are playing together, for example with their height, to generate comforting shadows areas and the narrow gateways allows to have air flows at the ground level. The opaque walls that are always under the shadow are then substituted by vast glass facades able to expand the inner spaces to the outer ones, connecting in this way the masses’ spaces with the voids’ ones. Surely the challenge of integrating the remains of the old Baghdad Governorate building has been challenging, along with limited space for building development. Nevertheless this suggested an original elaboration of the plant. The particular striated pattern plays an important role to link with traditional architecture. The projection of the pipes helps to have an irregular surface, generating shadow on itself. Not only, the configuration of these elements facilitates to define vertical apertures, hiding themselves within the pattern, that in this case can profit of the shadow and so not being directly under the influence of sun. 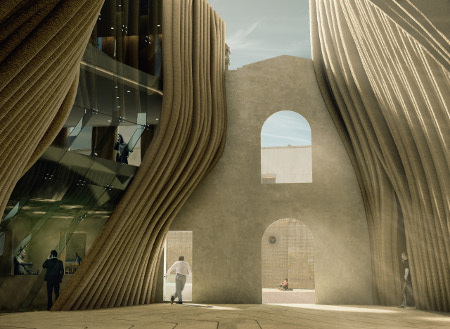 The buildings are characterized by 3Dprinted clay walls, a strategy to embed thermal absorption and structural performance in ones. The walls are defined by a series of pipe like elements intersecting each other. The intersection makes the wall stronger, but not only, it generates a series of void chambers. Some of them are used to cast the concrete pillars, with no need for additional molds and at the same time they function as a thermal insulator. 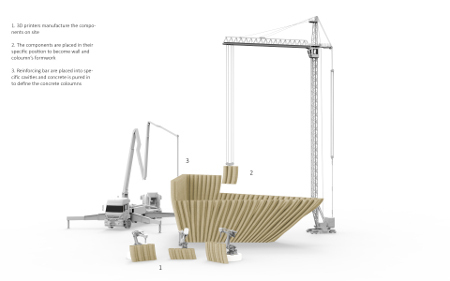 The 3D printed clay wall is designed to be built directly in the construction yard using robotic manufacturing technology. The components are then placed in the correct position and after the insertion of the steel reinforcements, the concrete could be poured inside the dedicated cavities to structurally consolidate the wall.